This city close neighborhood was built on high ground in the 1920’s and became home to many doctors who worked at the University of Colorado Hospital which developed at that same time. Diverse architecture, lush parkways, and two vibrant neighborhood parks make this a popular place to live. Cranmer Park was named for Denver’s park manager George Cranmer who donated the land for Denver’s 1st city park. His landmark Mediterranean home enjoys spectacular views of the Rocky Mountains. The park boasts an inlay of Colorado’s highest mountains as well as a sundial. Used for kite flying school games and picnics, this park is a favorite. Robinson Park was donated by the Robinson family when it moved its brick yard from the corner of 3rd and Fairfax. Robinson Park has a playground and is a great sledding hill on snowy days. 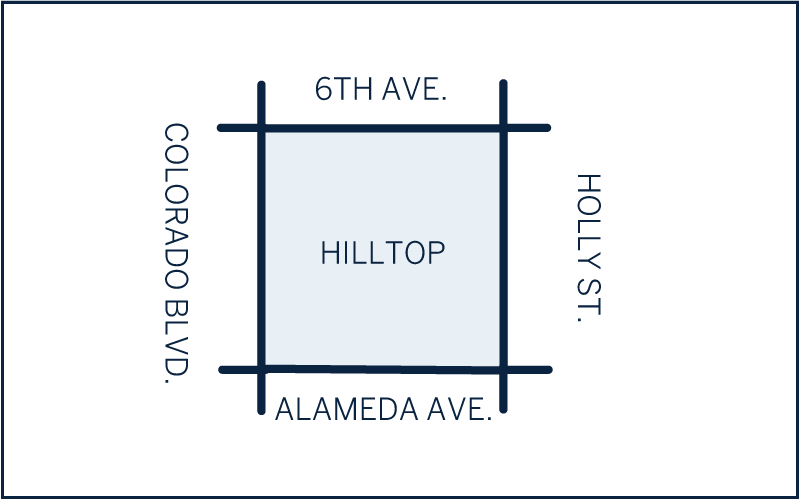 The architecture in Hilltop is diverse, blending Tudors and classic two story residences with “pop tops” and scraped lots featuring large custom homes. Price here start in the $600s and go up to several million.